Cookies must be enabled to use this Measurement Wizard! This is the self-measurement wizard from the Prom Dress Boutique. 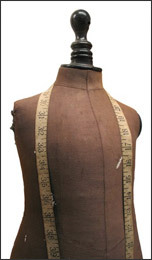 Through the following pages you will be shown how to measure yourself in order to provide correct measurements to us for your new Ball Gown or Prom Dress. On each page there will be a picture and instructions and when complete, you will be able to print out the results. To gat started you will need a tape measure and maybe someone to give you a hand.